Based on the other, none destruction, heroes of similar stats/rules. It should come in at about 300-360ish. The GUO costs 340 points. Jebus that MW charge roll. It's like a Cabbage on steroids. Doesn't even require the models to be within in 1" just one of them. It's actually a really large buff for the model, it also doesn't have the monster damage table. Depends on how big the model actually is. Now that your saying it, that’s immense. well not better then skarbrand, but still amazing. I know, it's glorious. Go look up Beastcaller's Bones from Ghur and realise just how Gross that item now is on a Troggboss! Oh baby stop, I can't handle all this madness. It's just to good. No you can't keep that ethereal amulet, yes you are going to be taking mortal wounds every battleround. Yes that is out of turn Morathi, go ****** yourself! What was the problem with the beast lord command? I run one and he is a solid hero. He's really really good in gavespawn, since you can give him the unique artifact and he can pretty reliably one phase kill most heroes and trigger reroll failed hits and wounds. Sure, it can be situational, but it's a powerful buff to breyherd. Plus in gavespawn when he dies you get a spawn on anything but a one. Gavespawn are best! I'm re-building my beastmen (from mine and friend's old 6th ed beastmen armies) army for AoS and I did chose to do Khornate Gavespawn army. With 2 Beast Lords, lots of gors, chariots and centigors. And some spawns. Maybe add some bestigors later. 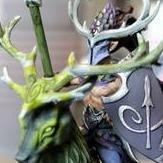 Beast Lords are one of my favorite heroes on Chaos! At least if you want to make him your general. But I think it could work if you should him with Spore-fanatics, for example. I'm sure it is a mistake. Otherwise that would be very odd. The Dragon Ogor Shaggoth is a Monster for example. Why would you ever use a fungoid general over Skragrott though? 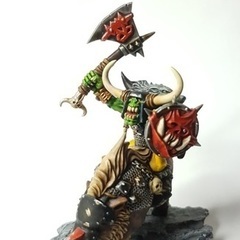 Some questions regarding "battleline Iff"
Does the Dankhold Troggboss have to be the general to get battleline Troggs? 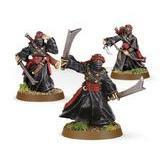 If I want to run Skragrott as my General does that preclude me from having any of the "battleline if" options? 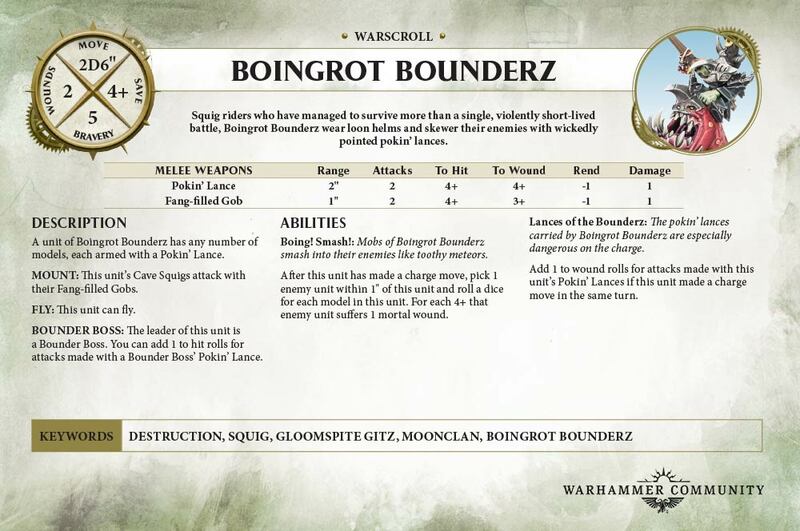 Can a ManglerKing take Boingrot Bounders as battleline or is it Squig Hoppers only? I'm actually really hoping it isn't. There needs to be more Megaboss style big heroes that aren't monsters! Well the Dankhold does not degrade, is no Monster (-1 to hit, cover, recovers wounds), has absurd dmg (without even an artefact), he buffs, is immune to magic and he has an instant kill attack build in.... he should be priced 50-60pts higher than a Leviadon and be closer to a Stardrake pointswise, everything else is mildly put absurd. otherwise people will just spam him 3x and 180 grots. I am complaining though I‘ll Propably start a Troll army, I still dislike absurd cheap powerful units just so they can sell more of them. I have to say that I don't like the Skragrott model that much. Also I was never a fan of named heroes. I like creating my own heroes with their own backstory. A named hero instead always has some kind of backstory, which I can't influence. This is why I like unnamed heroes more than named ones. He is carrying the old Skull Wand of Kaloth! They even kept the name. Fun Old-World references like that just make me happy. Ah, that makes much more sense. Thanks! It depends on how the Fungoid Shaman's scroll reads when the book comes out. If he still has to be your general in order to use his command ability then I think there is still use to have him as your general depending on the army build. Looking at the warscrolls that were released today there is a major bonus for charging with Boingrot Bounders and the Fungoid's command ability can disengage them so you can bounce off and charge again. My hope is that they ditch the "has to be your general" restriction from his command ability since I would probably most often prefer a different general (such as for unit unlocks), but if the restriction remains at least there is some synergy that we definitively know about. His healing is a bit bad though... 4+ for D3 wounds back,,, maybe all trolls are dropping to a 4+ as they are currently a 2+. On the other hand having a key figure or two can help quickly inject some sort of story with a faction and also even become beloved, like Skarsnik or Grimgor. Especially for a game like AoS where a lot of the fluff is unknown. I mean I love BoC, but felt at least a character or two would help them get some personality other than "we're chaos marauders with goat heads". An AoS version of Kholek Suneater (maybe his successor) would have been cool. Or the Brass Bull. Plus so far theres plenty of generic heroes for GGs. No you can't keep that ethereal﻿ amulet, yes you are going to be taking mortal wounds every battleround. Yes that is out of turn Morathi, go ****** yourself﻿! The extra command points seem nuts. Never take battleshock for grots! Well the Dankhold does not degrade, is no Monster (-1 to hit, cover, recovers wounds), has absurd dmg (without even an artefact), he buffs, is immune to magic and he has an instant kill attack build in.... he should be priced 50-60pts higher than a Leviadon and be closer to than a Stardrake pointswise, everything else is mildly put absurd. Compare it to the Dragonlord warscroll. Dragonlord has more attacks, better command ability, double the movement, Reroll failed saves, ranged mortal wound output which isn't a shooting attack and fly all at 340 points. Troggoths can re-roll the dice to see if they regenerate wounds, or double the results of their first roll. There is so much more to it than only the healing. Monsters at his powerlevel are 380+ points and they degrade, don‘t get cover, csn‘t Heal themselves, don‘t have 4 D6 dmg attacks, aren‘t Immune to magic and they don‘t get -1 to being hit if 3 grots are around. + a free CO ever herophase... well. I‘ll seriously deny games against armies with 2+ dankholds then. Spam 4 and put the rest in normal grots and mages GG. ... and now compare him to the Leviadon. 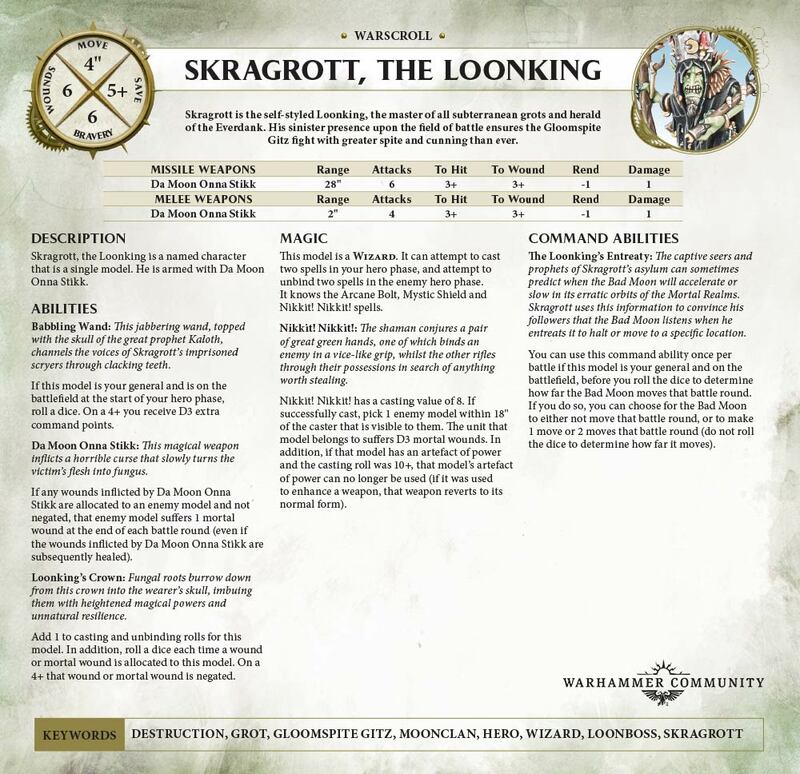 Im liking Skaggrot but i wouldnt take him as my general. The d3 extra CPs are nice but i imagine there are some tasty command traits out there in the book. With the badmoon over his board quarter he will get a +2 to cast! so he only needs to roll a natural 8 to stop artifacts!! !